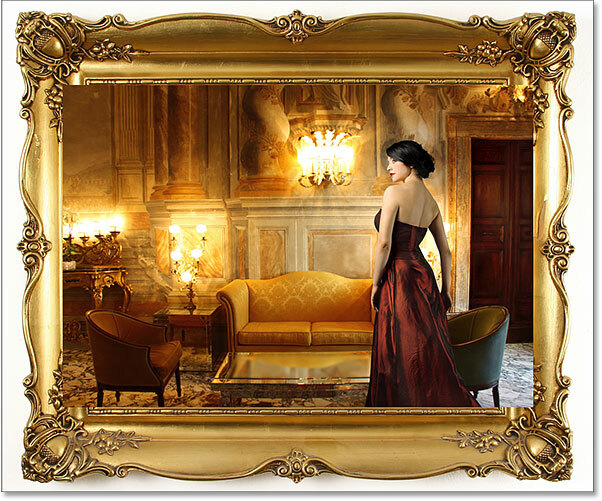 Learn all about the Background layer in Photoshop, including why the Background layer is special, the limitations of the Background layer, and how to easily get around those limitations! So far in our series on Photoshop layers, we've learned the basics of what layers are and why they're so important, and we've learned the essential skills for working with layers inside Photoshop's Layers panel. But before we get into more of the amazing things we can do with layers, there's one special type of layer we need to look at, and that's the Background layer. The reason we need to learn about it is because there's a few things we can do with normal layers that we can't do with the Background layer, and if we're not aware of them ahead of time, they can easily lead to confusion and frustration. This tutorial is specifically for Photoshop CC (Creative Cloud), as Adobe made a couple of changes that do not apply to earlier versions. 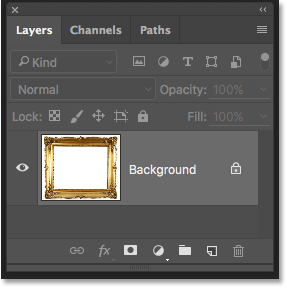 If you're using Photoshop CS6 or earlier, you'll want to check out the previous version of our Background layer tutorial. 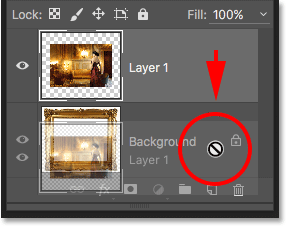 This tutorial is Part 4 of our Photoshop Layers Learning Guide. A photo of a frame for a photo. Photoshop names this layer Background for the simple reason that it serves as the background for our document. Any additional layers that we add to the document will appear above the Background layer. Since its whole purpose is to serve as a background, there's a few things that Photoshop won't allow us to do with it. Let's take a quick look at these few simple rules we need to remember. Then, at the end of the tutorial, we'll learn an easy way to get around every single one of them. Selecting the Move Tool from the Tools panel. Trying to move the Background layer using the Move Tool. 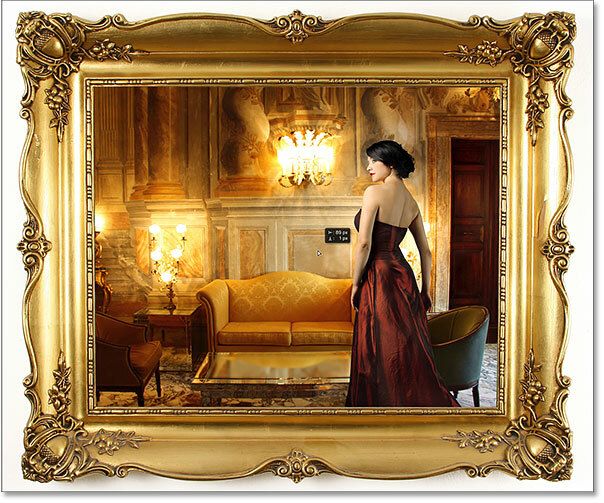 Instead of moving the photo frame, Photoshop gives me a lecture about Background layers. You could, of course, click the Convert to Normal Layer button and that would be that. But later on, we'll learn an even faster way to convert the Background layer into a normal layer. For now, let's take a closer look at exactly what it is that Photoshop won't allow us to do with Background layers. The lock icon lets us know that some aspect of this layer is locked. In a moment, I'm going to open another image and place it inside my photo frame, but the center of the frame is currently filled with white, which means I need to delete that white area before I can place my photo inside of it. Normally, when we delete pixels on a layer, the deleted area becomes transparent, allowing us to see through it to the layer(s) below. Let's see what happens, though, when I try to delete part of the Background layer. Selecting the Magic Wand Tool. 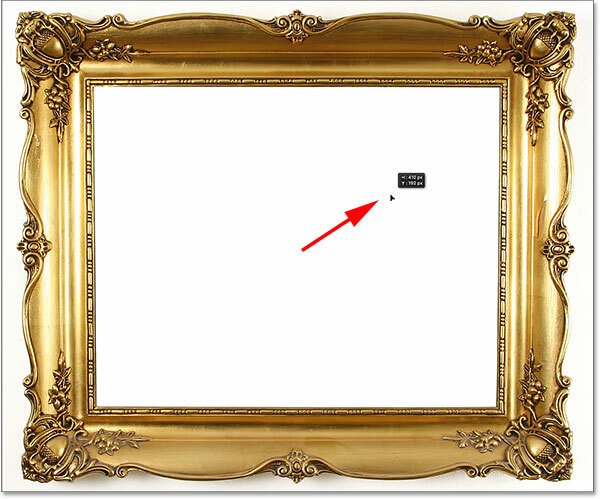 The white area inside the frame is now selected. 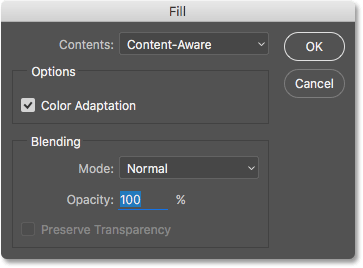 Instead of deleting the area, Photoshop pops open the Fill dialog box. Going to Edit > Cut. The white area inside the frame is now filled with... white? Why is it still filled with white? It's because even though it looks like nothing happened, something did actually happen. Rather than cutting out that area and leaving it transparent, Photoshop filled it with my current Background color. The Background color is now black. Going to Edit > Undo Cut Pixels. Going once again to Edit > Cut. Photoshop keeps filling the selection with color, but what we need is transparency. So, what's going on here? Why won't Photoshop simply delete the area inside the frame? Why does it keep wanting to fill it with a different color? The reason is because Background layers don't support transparency. After all, since the Background layer is supposed to be the background of the document, there shouldn't be any need to see through it because there shouldn't be anything behind it to see. The background is, after all, the background. No matter how I try, I will never be able to delete the area inside the center of the frame as long as the image remains on the Background layer. 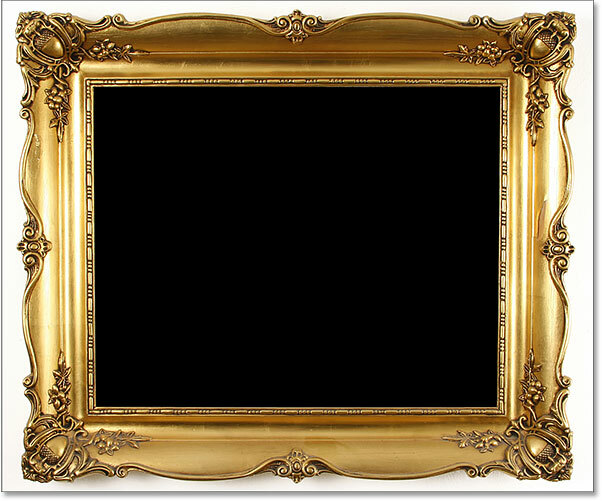 How, then, will I be able to display another photo inside the frame? Let's leave this problem alone for the time being. We'll come back to it shortly. 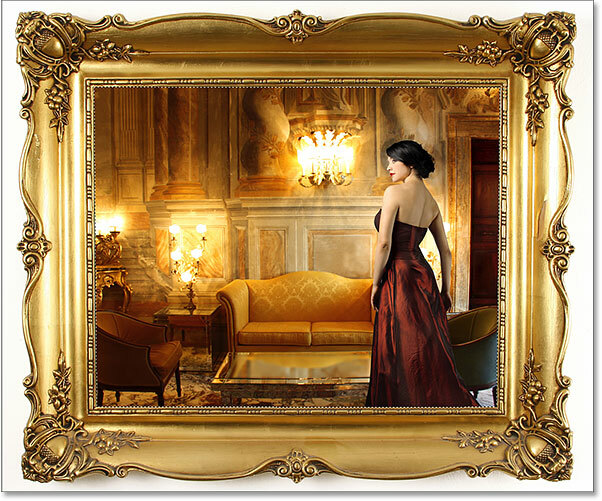 The image that will be placed inside the frame. The image is currently open inside its own document, so I'll quickly copy it into the photo frame's document by pressing Ctrl+A (Win) / Command+A (Mac) to select the entire photo. Then, I'll press Ctrl+C (Win) / Command+C (Mac) to copy the image to the clipboard. The second photo is placed on its own layer above the Background layer. The photo currently sits in front of the frame. The circle with the diagonal line through it tells me I can't drag the Background layer above Layer 1. The reason it won't let me drag the Background layer above Layer 1 is because the Background layer must always remain the background of the document. Photoshop won't allow us to move it above any other layers. 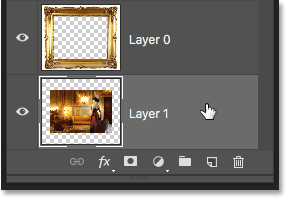 The same "not gonna happen" icon appears when trying to drag Layer 1 below the Background layer. Again, the reason is because the Background layer must always remain the background of the document. We can't drag it above other layers and we can't drag other layers below it. Let's quickly recap. We learned that Photoshop won't let us move the contents of the Background layer with the Move Tool because the layer is locked in place. We learned that the Background layer does not support transparency, so there's no way to delete anything on the layer. And we learned that the Background layer must always remain the bottom layer in the document. We can't drag it above other layers, and we can't drag other layers below it. There's a few more things we can't do with the Background layer that we'll look at quickly. 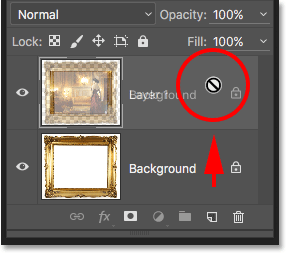 I'll click on my Background layer to select it, and notice in the upper left of the Layers panel that the Blend Mode option (the box that's set to "Normal") is grayed out. 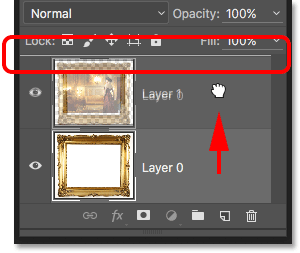 Normally, we can change a layer's blend mode, which changes how the layer blends with the layer(s) below it. But since the Background layer must always remain the bottom layer in the document, there will never be any layers below it, which makes the Blend Mode option rather useless. 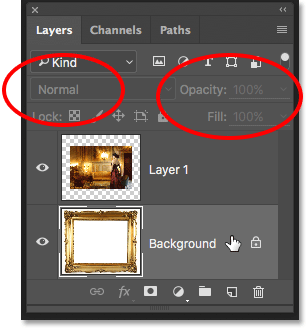 The Blend Mode, Opacity and Fill options are unavailable with the Background layer. Since the Background layer's whole purpose in life is to be the background of the document, each of these rules makes sense. Yet as with most rules, there's ways around them for times when we need to break them. In this case, there's an easy way around all of them at once! All we need to do is rename the Background layer to something other than Background. It's really that simple. 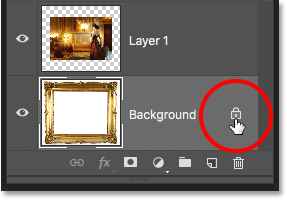 Clicking the Background layer's lock icon. The Background layer has been renamed Layer 0. And just like that, with a single click, we've converted the Background layer into a normal layer, which means we're no longer bound by any of the rules we just looked at! 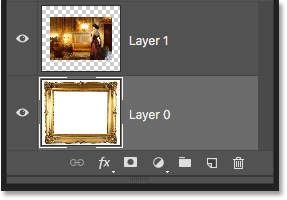 We can move the contents of the layer with the Move Tool, we can delete anything on the layer and replace it with transparency, and we can freely move the layer above or below other layers! Dragging Layer 0 above Layer 1. 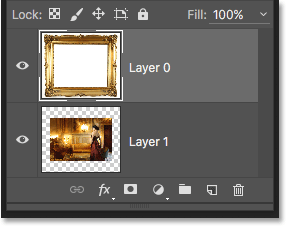 Layer 0 now appears above Layer 1, which would not have been possible while Layer 0 was still the Background layer. 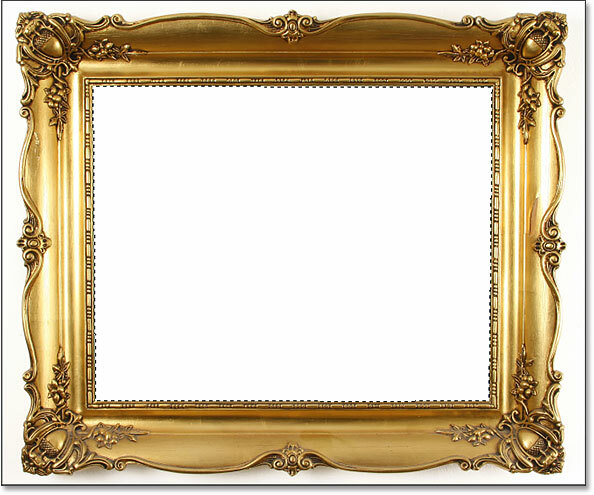 The area inside the frame is once again selected. 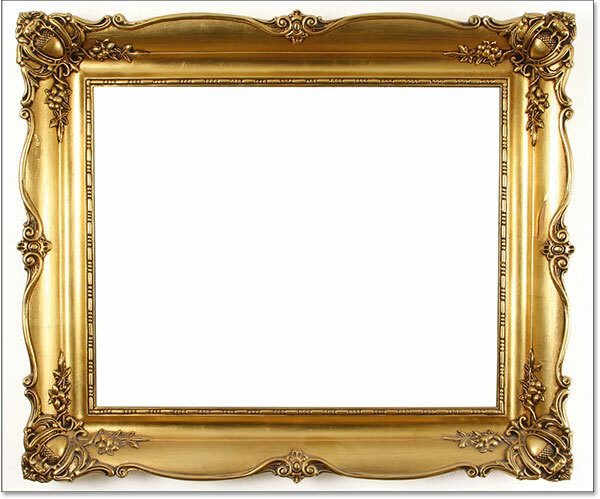 The area inside the frame has finally been deleted, revealing the photo underneath. Dragging the photo into position inside the frame. 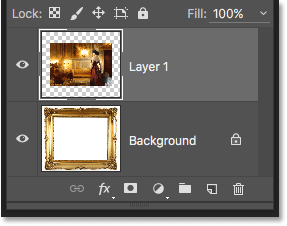 Finally, we've seen that we can convert a Background layer into a normal layer just by renaming it anything other than "Background". But what if we want to go the other way? 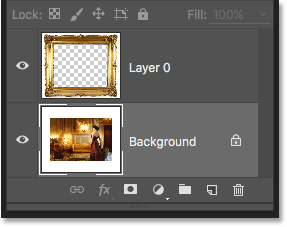 What if we want to convert a normal layer into a Background layer? Is it possible? Yep, it sure is, but how you go about doing it isn't quite as obvious. 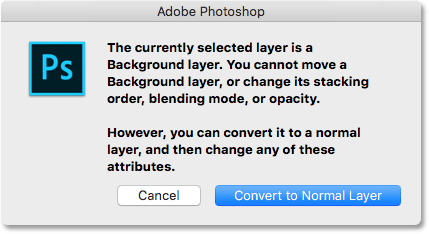 You might think that the same logic applies both ways; if we can convert a Background layer into a normal layer by renaming it something other than "Background", then we should be able to convert a normal layer into a Background layer by renaming it "Background". Makes sense, right? Unfortunately, that doesn't work. All you'll end up with is a normal layer that happens to be named "Background". Selecting the layer to convert into a Background layer. Layer 1 has been converted into a Background layer. Of course, there was really no need in this case to convert my bottom layer into a Background layer. All I've done at this point is placed limits on what I can do with it. But there are plenty of times in Photoshop, especially when creating effects or compositing images, where creating a new Background layer is extremely useful. In the next tutorial in our Layers Learning Guide, we'll go through the steps of creating a brand new Background layer from scratch, along with an example of why you'd want to create one. And as a bonus, we'll save our steps as a time-saving action!